With the holiday season upon us, NHLPA Goals & Dreams (G&D) wrapped-up a special two-day set of events with KidSport Alberta on Friday afternoon. 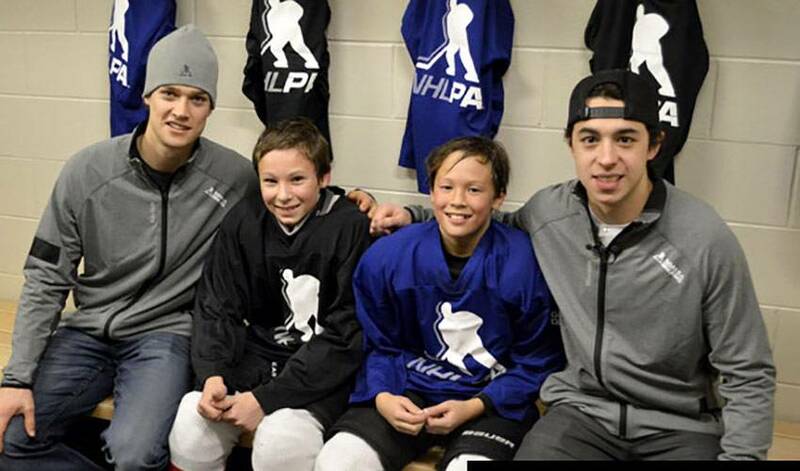 At the Cardel Rec South arena in Calgary, Alta., Johnny Gaudreau and Mason Raymond surprised a group of peewee hockey players from Cochrane. The event commemorated G&D's donation of 50 sets of new hockey equipment – valued at $25,000 – that KidSport Alberta will distribute to children in surrounding communities, while providing lasting memories for those in attendance. Representing G&D, Gaudreau and Raymond surprised and greeted two minor hockey teams, the Cochrane Fury and Cochrane Rockies, in their dressing room following an hour-long practice. Raymond provided a unique perspective on the day as a native of Cochrane himself. And if a visit from an NHL player who shares the same hometown as them wasn't enough, then the presence of Gaudreau – a budding star forward who scored the game-winning goal for the Flames the night before – added another thrill these aspiring young hockey players won’t forget. Gaudreau made a point of mentioning how much an event like this would have meant to him as a youth hockey player, "I would have been just as excited as the kids were. It's great to see their faces, to see how excited they are. Me and 'Mase', we enjoy stuff like this, and it's great to spend some time with the kids." Knowing the two NHLPA members - and pizza, of course - were waiting for them upstairs, the children quickly got changed after their dressing room surprise. There, Gaudreau and Raymond answered several questions from the eager kids – including why they wear the numbers they do, how they scored their first goals, who their favourite players and teams were growing up and what level of hockey they played when they were the same age as the children. With the group of children, parents, NHL players, and representatives from the NHLPA and KidSport Alberta in attendance, G&D Chairman Devin Smith spoke about the program's support for KidSport Alberta. Meanwhile, KidSport Alberta Executive Director, Erin Bilawchuk, talked about the work their organization does to enable more children to play sports and how G&D's equipment donations, coupled with KidSport's contributions to cover registration fees, have allowed many more kids to play hockey. KidSport Alberta is on target to help nearly 10,000 kids play sports in 2015, and last year helped 1,219 kids get into hockey. Now in its 16th year, NHLPA Goals & Dreams has donated more than $23-million to grassroots hockey programs in 34 countries around the world. For the players – both of the minor hockey and NHL variety – the G&D event in Calgary was both an invaluable and enjoyable one. With this, Gaudreau added, "It's great, I was really fortunate to be a part of this special day." In this week's Player Q&A, we learn that Johnny Gaudreau is a real family man, and which soccer star he's rooting for when he tunes into his favourite sport (other than hockey, of course).